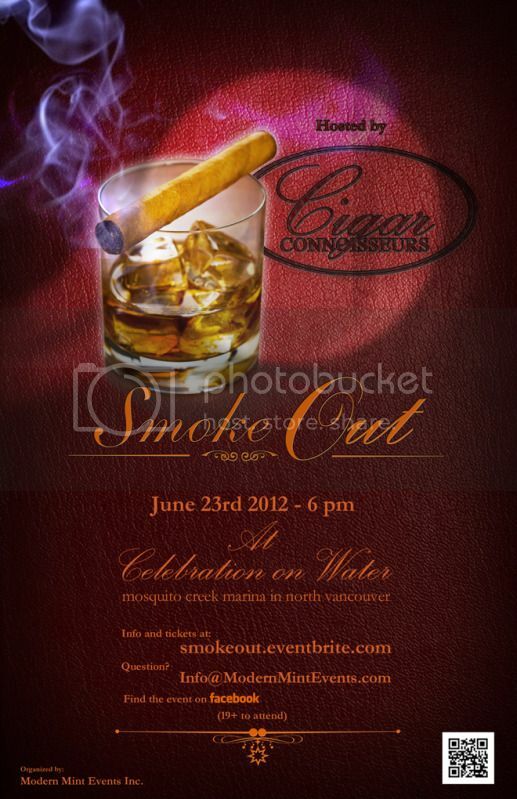 Hosted by Cigar Connoisseurs in gastown, Smoke Out will be introduced for the first time on June 23rd 2012 at the Celebration on Water Venue in North Vancouver. The lounge will be presented for the enjoyment of savvy men and au courant women alike in a one-of-a-kind outdoor smoking lounge and cigar bar; providing a panoramic view of Coal Harbour from the water’s edge. Whether a cigar aficionado, collector, or someone non-experienced with fine cigars, this is an experience for guest to learn about cigar culture and enjoy the sophisticated brands as they have been enjoyed by elite members of society for centuries. The multi-level cigar bar will offer live thematic music by miss Amanda Wood, comfortable lounge seating, Scotch Whiskey tasting, and cigar sales. From the moment guests arrive, they will be treated with a red carpet experience, including a celebrity style photo opportunity, complimentary welcome cocktail, complimentary cigar and a stunning lounge to mix, mingle, and take in the view. Note: Bring your printed e-ticket to Cigar Connoisseurs and receive 20% off your next purchase! Organized by: Modern Mint Events Inc.
Visit the Smoke Out Facebook Event page for more details.